Hair styling in my house is something of an art form - I have a shelf of everything from gel, to putty to wax. After years of trying to find the right products for my hair I’ve even dabbled with mousse and clay. Wella was always a favourite after first having my hair cut into spikes. The length went from around nine inches in length to 3 inches. As I decided I liked the look I went even shorter to an inch. 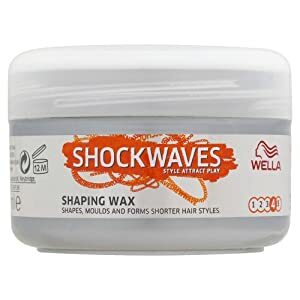 Being as adventurous as you can be when choosing what to slap onto your hair I opted to part with just £2 for a small 75ml tub of the Wella Shockwaves Shaping Wax. The Shockwaves range has always been a personal favourite but in a nutshell this stuff is pants and in a true Bryn style* and in my best Welsh accent I tell you for why. The products claims to offer quick and easy styling. This is meant to be a strong hold wax that will sculpt and shape any hair, individually separate strands, give texture and brush out easily after use. It doesn’t. I’ve had a numerous bad experiences with wax in the past, and found that once it had been applied, it could take days to wash out leaving my hair looking greasy and unkempt. After looking at the product in the tub it was clear that this wax wasn‘t as thick as others and I was fairly confident that this one wouldn’t be as bad. I applied the wax to my hair after it had been dried. White in colour, it has a similar colour and texture to lard. Nice! Surprised by the fragrance, while looking vile it actually smells lovely. A clean crisp aroma not too dissimilar to Nivea body lotion. It was very subtle and definitely not overpowering. My hair at the time of using this wax was around two inches in length. I needed to use a substantial amount of wax to completely cover my hair. The wax was absorbed very quickly. Styling was a breeze, the new texture to my hair was wonderful. As the wax hardened my hair became very rigid, but not crisp (likes it does when I use a gel). It did take about 30 minutes for the wax to start to harden, so this did mean that I had to keep checking in the mirror to make sure it was still looking OK.
Once hardened the wax didn’t make my hair shinier, it started to look greasy. The longer it stayed in, the more it looked greasier and greasier. This has never been a look I’ve aspired to have, even when under the influence. The wax kept my style in place all night, but sadly another downside was when it came to washing it out. It doesn’t brush out, and it actually took three washes to get all traces out of my hair. Would I recommend this product. No. While it smells nice and does have great hold, the fact that your hair looks like it has been dipped into a deep fat fryer means that you will look a state. That’s a guarantee. Combine the look with the fact that it will take you around an hour to remove all traces of it then it’s sadly one of those products you should just steer well clear of. 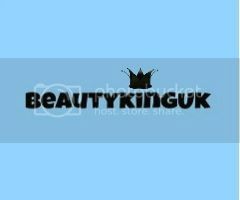 There are better waxes on the market that offer better hold, better value for money and are easier to wash out. Have you had a hair product nightmare? Why not share it with me in the comments section below. If you are not familiar with the BBC comedy Gavin and Stacey - the actual reference can be found here and if you scroll to two minutes and sixteen seconds you’ll see what I mean!